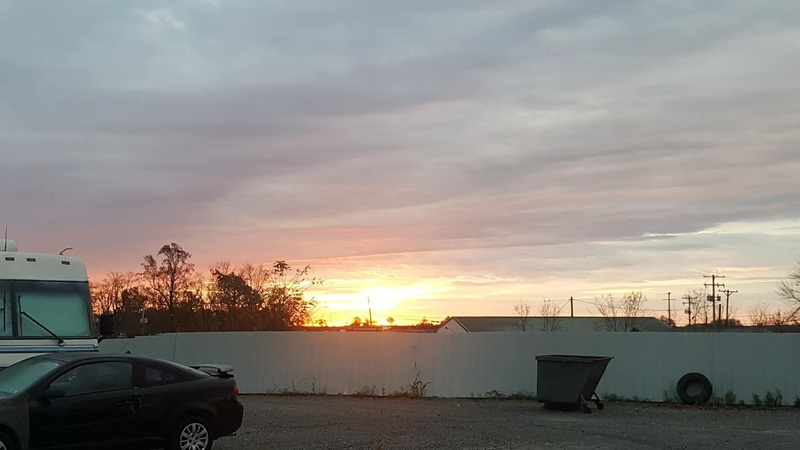 7:16 am - Wednesday - November 7th - Campbellsville, KY - 46º F, 81% humidity, wind 2 mph out of the east.......cloudy today with a forecast high of 51º F......my, how the weather changes from day to day here in Campbellsville! It would seem, in retrospect, that Monday's late move into Building 'B' portended how things would go for me on Tuesday, our VET (Voluntary Extra Time) day. Just when I needed a mental boost the most I received it in spades. I began my day in Building 'B', and never left it. I wandered through the endless rows of Pick Mods P-1-Q, P-1-D (Pick Mod D has four levels like K, but I only picked on P-1 on this day), P-1-J, P-1-K, P-2-K, P-3-K, P-4-K, P-1-L, P-1-M, and last, but not least P-1-N. Pick Mods J, L, M, N and Q have only one floor. I needed a day like Tuesday with lots of variety, and a total lack of same old, same old. It felt like I had a little extra bounce in my step all day through. Regretfully, TLE was still locked down in Building 'C' for the entire day......there was, one might venture, a little 'gnashing of teeth' on our way home about her plight. I think she is inclined to have a word with our manager, Keenan, on Friday about being released into Building 'B'. Tuesday was also the first of two catered 'Holiday Meals' served at lunch time for the Amazon workers. The second will be on Friday, and, as it turns out, we will be able to enjoy both meals since our next work day happens to be Friday. The extra bonus is we get 45 minutes for lunch, with 15 minutes paid. Not a big deal by any means, but much appreciated. We did not have to clock in, or out for lunch.....that will be taken care of by HR. Most of our friends from our orientation group back on October 22nd did not volunteer to work on Tuesday.....they wanted that 3 day 'weekend'. We will not take VET the next two, or three Tuesdays, because after that it will most likely become an MET (MANDATORY Extra Time) day for the remainder of our time here in Campbellsville. Even without overtime we will be grossing $1200 every Friday....not too bad. We were home by 5:10 pm delighting in the fact that we did not have to be in bed by 8 pm, and we did not have to work on Wednesday and Thursday. We chose not to watch endless hours of Election coverage. It is just another political outcome that will be made too much of, and endless mind numbing opinions will be offered about what it all means. The political class in D.C. will continue to do what they do, and for the most part it will have little, or no effect on most Americans. There will be slight shifts of power, but in the end none of them really cares a wit about any of us. We will continue on with our vagabond lives living free, abundant lives, loving our children, and grandchildren, and great grandchildren. We will continue to spend most of our time in rural America with good, salt of the earth people.....regardless of their political persuasion. It is amazing to us that most people we come in contact with care little, or nothing about politics. The only comments we hear are 'When are the political ads going to end? "......well, they are over for another 24 months.....thank God.